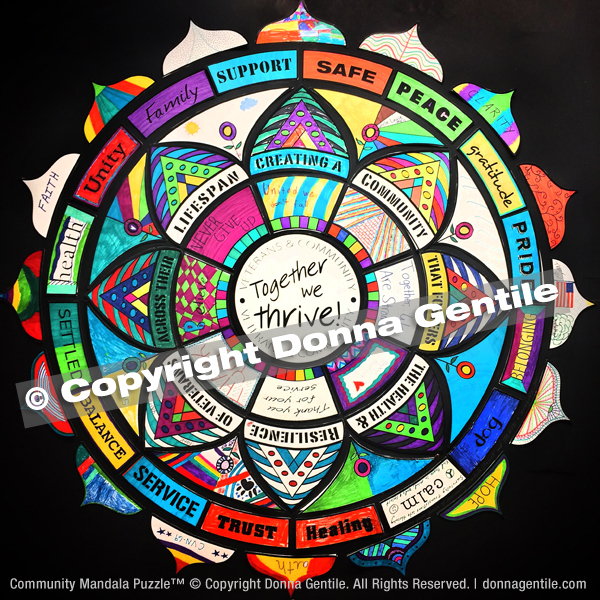 The Community Mandala Puzzle™ Workshop is a powerful, community-building experience custom designed to incorporate your logo and tagline as well as meaningful symbols and power words to reflect your message or philosophy. It is available as a 48-piece or 72-piece puzzle workshop facilitated by Donna Gentile at your special event or facility and you get to keep or gift the actual puzzle, which ranges from 44″ x 44″ to 50″ x 50″ of AWESOMENESS! The workshop is fun and provides a meaningful, one-of-a-kind experience. It’s great for indoor or outdoor functions and events. Participants engage in meditative coloring and build the puzzle as a group. They leave with mini mandalas (an added bonus) and cherished memories as well as photos of their work to share on social media. 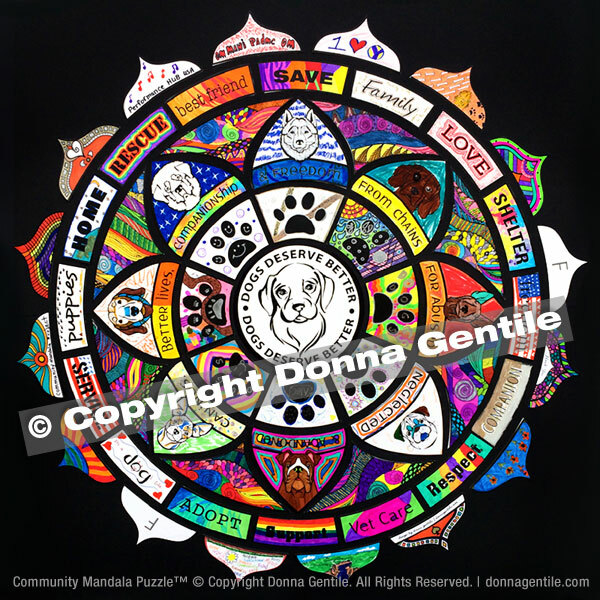 And that’s not all… you get to keep or gift the huge Community Mandala Puzzle! In addition to offering your guests a unique and meaningful experience, and getting to keep or gift gorgeous artwork, you get the opportunity to use your Mandala Puzzle as content to promote your business, cause or message. There is so much value added to this workshop! Ya just can’t sell it, put it on anything for sale or use it in anything for sale. And ya can’t reproduce the artwork/images and present them as your own designs or duplicate the workshop without permission from the artist Donna Gentile. Please read “Legal Copyright” below. 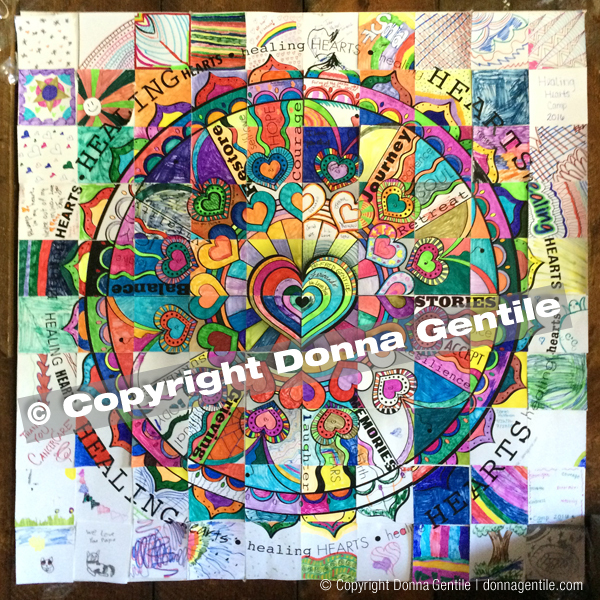 The Community Mandala Puzzle™ Workshop and all workshops on this website are © Copyright Donna Gentile, All Rights Reserved. Titles, content, workshop descriptions, prototypes and images may not be reproduced, copied, used, altered, used to make derivative works or sold (and workshops themselves may not be duplicated/taught or sold) without permission in writing from the artist. People — I’ve worked since 2004, designing, developing, teaching and refining my workshops ane the prototypes and retouched images you see here or may find elsewhere online. Please respect my intellectual property and legal copyrights. Usage rights and compensation must be agreed upon in writing. If you want to teach workshops like mine, contact me and/or let my work inspire you to create your own unique workshops, prototypes and experiences. Thank you! For an additional fee, you may purchase photos or commission Gentile to make a YouTube movie for you. View sample YouTube videos (link on it’s way!). Inquire at donnagentile.com/contact.